Are you looking for a day of fun and sun on the water? 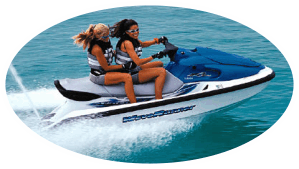 Sunset Watersports offers one of the largest selections of Key West boat rentals and jet ski rentals to choose from. All their boat rentals come fully equipped and all will work well for either a day spent fishing or a day spent snorkeling and swimming. Sunset features some of the best pricing for boat rentals we've found on the entire island, especially when you take advantage of their on-line boat rental discounts. With Sunset you will have the option to rent a boat for either a full day or for a half days boat rental. All of Sunset Watersports boat rentals that are recommended for fishing include all the necessary gear such as electronics, live wells and bait wells. Sunset Watersports offers a great variety of boat rentals to choose from. They have a boat rental that will fit your needs and price range. Sunset Watersports is also one of the oldest and most respected boat rental outfitters on the island. Pontoon boats work well for cruising around the shallower areas and not on the open seas. 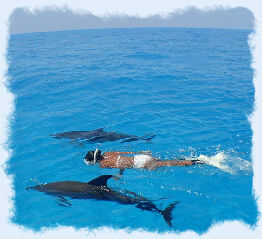 They are good boat of choice for both snorkeling or swimming. Center console boat rentals offer the best choice for fishing and offshore adventures. They include all the electronic equipment necessary for fishing and can handle rougher waters. Skiff boat rentals are best suited for the shallow back country areas that surround Key West. If you plan on fishing the flats for Bonefish or Tarpon this is the boat rental for you. Have a blast exploring the lower Keys with this sporty little speed boat rental. This is the perfect boat rental for sightseeing and spending a day having fun in the back country of the Florida Keys. For available boat rental times & prices please click on the more info button. If you're looking for a day of relaxation and spending a day in the sun then a pontoon boat rental may be the right choice for you. This is also a great boat rental for snorkeling and if you're on a budget. For smaller groups that are looking for a fishing adventure this 17 foot center console boat rental makes a great choice for you. This boat rental is also a good choice for those looking for an excellent value. This versatile Key West boat rental is an ideal choice for just about any activity watersport activity you choose. This boat rental will work great for fishing, snorkeling or just cruising around the lower Keys. This boat rental is the best choice for exploring those shallow back country areas surrounding the lower keys. For anyone looking for a back country Tarpon fishing adventure this is the boat rental for you. This boat rental is another versatile offering that will work well for most boating adventures. This center consoles makes a great fishing boat and offers a little more room for larger groups. This boat rental is your best choice for anyone looking to spend the day further off shore on a fishing or snorkeling excursion. The Cobia boat rental also offers more space for those looking for a larger boat to accommodate a few more passengers. This boat rental is the perfect selection for larger groups that just want to spend a day cruising and relaxing on the crystal blue waters surrounding Key West. This boat rental works well for swimming and snorkeling. Anyone under the age of 27 is required to have a Florida Boater License to operate a boat rental. Sunset Watersports offers a Florida boaters license course for just $4. The exam will only take approximately 15 minutes to complete. You should arrive at Sunset's location at least one hour before your scheduled boat rental time. located at the Hurricane Hole Marina on Stock Island. The Marina is located just over the first bridge from Key West off highway US1. located at the Hurricane Hole Marina. Sunset Watersports Key West boat rentals. Key West's number one boat rental company! This is one Key West attraction that should be on everyone's bucket list. Sunset Watersports offers one of the islands greatest watersport options with their all day adventure package. The do it all watersport package includes twelve different watersport adventures, all for a great price. You'll spend the entire day on their 65 foot yacht. The regular price is $139 but you can save an additional $30 by booking on-line with them. Children are only $59 and five and under kids are FREE. The voyage includes a hot lunch right off the grill and even FREE beer during the return voyage back to the home base. Island Waverunner Tours at a GREAT PRICE! Key West Accommodations on the Beach! Info / Luxury Key West Resort Condo Rentals on the Ocean!